Earlier this month, I had the pleasure of helping to judge Anna Depew's Name That Dress Form Contest. Pop over to Anna's blog, A Few Threads Loose to see who won! 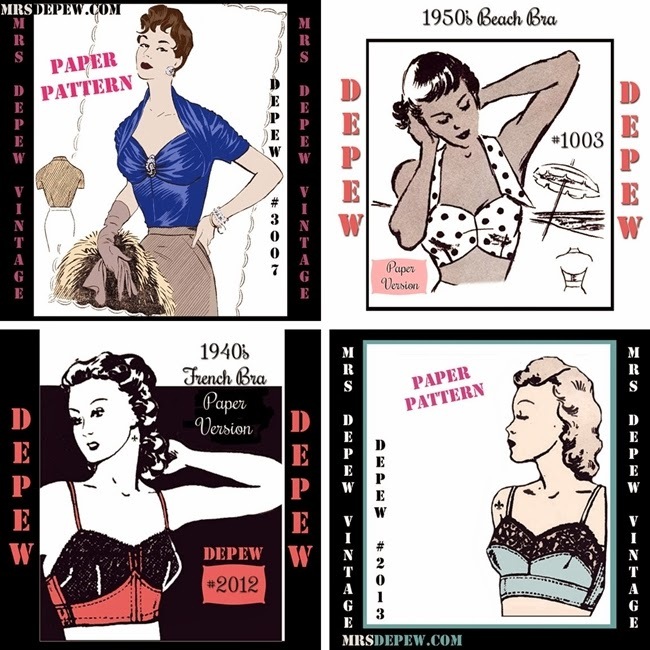 Anna has been very busy these past few months with several new patterns and mking many of our favorite Mrs Depew Vintage PDF sewing patterns available in paper format! I love a PDF for the ability to get your pattern from etsy to your home in a matter of minutes but if you're not into all of that cutting and taping, check out the new selection of paper patterns. Va-Voom Vintage readers always enjoy the exclusive coupon "VAVOOM" for 15% off at Mrs Depew Vintage. Amazing! Congratulations on making the jump - I think I need to save up some pennies now! Thanks so much for sharing this, Brittany! I've been having so much fun with the paper versions and am working on even more to be released soon! Those early 1930s evening wraps are taking my breath away!!! Love! Thanks for a fab year of blogging Brittney. Happy New Year to you when it comes, see you in 2014!